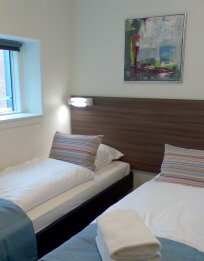 Our 1 bedroom apartments have kitchen, living room and bedroom with two comfortable single beds that can easily be moved together if you want a double bed. In the living room you have a dining table for two people and a sofa with coffee table. The apartments have fully fitted kitchen with oven, hob, microwave, fridge/freezer and dishwasher. The apartment has a nice bright bathroom with shower. It is possible to select 1 bedroom apartment with balcony. 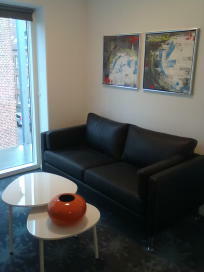 Do you need extra space, we recommend our apartments with 2 bedrooms.